Aggreko plc unveiled today a new fleet of 100% oil-free air (OFA) compressors for industrial and commercial applications. Compressed air is used in multiple industries and process applications, from heavy industries like petrochemical plants, manufacturing, steel mills and oil refineries to industries as diverse as food and beverage, agriculture, health care, pharmaceuticals and electronics. 100% oil-free air provides a vital support component for these industries’ processes to maintain a safe, clean working environment and smooth-running, reliable operations. “As global energy markets change, the challenges our customers face around limiting emissions and accessing reliable utilities are becoming ever-more complex. Aggreko’s commitment to evolve our oil-free air compressor line ensures our customers can deliver their highest standard performance, with the peace of mind they are running a viable solution that includes the latest emissions reduction technology,” said Terry Dressel, VP of Central Operations, Aggreko North America. 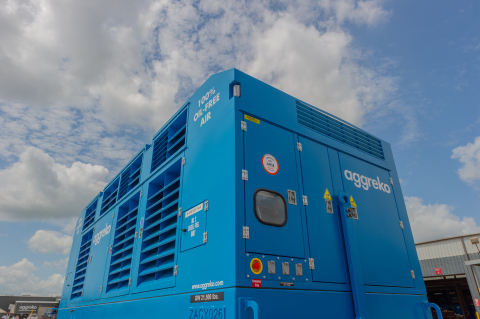 Aggreko offers CARB and EPA-certified Tier 4 Final (Tier 4F) diesel and electric oil-free air compressors beginning with the 1600 cfm models. The Tier 4F diesel engine provides a significant increase in run time, reliability and fuel efficiency with extended service intervals. This results in lower fuel and maintenance costs and longer uninterrupted runtimes for customers. The electric compressor is built with totally enclosed, fan-cooled motors allowing it to be used in a wide array of locations, both industrial and commercial. The new oil-free air compressors, assembled in the USA, are compliant with the toughest emissions standards in North America, feature ISO class 0 air out and deliver 1600cfm at air pressures to 55-150psi. “Aggreko’s certified 100% oil-free air compressors, air drying and air cooling equipment provide customers with the clean air needed to protect equipment, products, and the safety and comfort of their employees,” said Fernando Arce-Larreta, Aggreko Head of OFA. Available for short or long-term needs, Aggreko’s 100% oil-free air equipment is now in operation. Aggreko Remote Monitoring (ARM) is provided on all Aggreko compressed air equipment. The units provide operating parameters to the Remote Operations Center (ROC) where teams of field-experienced engineers and technicians monitor compressor performance 24/7 and are ready to respond to potential problems immediately. Performance data, alerts and service information are available to customers via an ARM smartphone app. For more information, visit www.aggreko.com. Aggreko works round the clock, making sure everyone gets the electricity, heating and cooling they need, whenever they need it – all powered by our class-leading equipment, trademark passion, unrivalled international experience and local knowledge. From urban development to unique commercial projects and even humanitarian emergencies, we bring our expertise and equipment to any location, from the world’s busiest cities to some of the most remote places on earth. That’s what has made us the world’s leading provider of modular, mobile power and heating and cooling. We’ve been in business since 1962. We have more than 7,300 employees, operating from more than 200 locations in 100 countries. With revenues of approximately GBP 1.6bn (USD 2.6bn or Euros 2bn) in 2016, we are listed on the London Stock Exchange (AGK.L) and have our headquarters in Scotland.